ambisonic.net - where surround-sound comes to life. The Ambisonic Toolkit (ATK) brings together a number of classic and novel tools for the artist working with Ambisonic surround sound. The ATK toolset has been been gathered, authored and developed by Joseph Anderson over a number of years, and is now a collaborative open source (GPL) project. The Ambisonic Motherlode - an attempt to collect and index all the available material on Ambisonics - and you can help! BBC Research & Development is looking at Ambisonics and Periphony again. See this article, and this piece on work at the North Lab (video below). Check out Stephen Thornton's impressive Michael Gerzon Photos site. Visit Ambisonia.com to experience Ambisonics first-hand - now! Check out the Tetramic from Core Sound – the first soundfield-type microphone available for under $1000. There is now a series of Wikipedia pages on Ambisonics, to which several of us in the Ambisonic community have been contributing. Important! Check out Daniel Courville's growing collection of Guides to the creation and distribution of Ambisonic recordings. We are very pleased to have been given permission by Nimbus Records to make available a DTS-WAV (DTS-CD) excerpt from one of their recent recordings, decoded from B-Format in the same way as our other experiments. Download the first three minutes of Elgar's Cello Concerto in DTS-WAV or DTS format. Getting Ambisonics Around. An article detailing the off-line production of G-Format material from B-Format and 2-ch UHJ sources and issuing it on DTS-CDs. April 2006 (PDF, 953K). Sample decodes are also available. Some exciting new developments in the field, with the definition of an Ambisonic File Format and the specification for a software player. See the Gear/Equipment page for more details. Find my other Transdiffusion articles by clicking here. A full listing of Audio and other articles can be found here. Welcome to Ambisonic.net - the Ambisonic Network - a collection of articles, sources and links detailing the subject of Ambisonic surround-sound and digital audio technology, compiled by engineer/producer Richard Elen with over 25 years of experience of using the system. If you're new to the subject of Ambisonics, hopefully you will find The Best Sounds Surround useful. 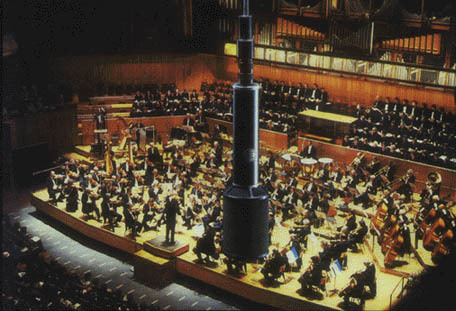 For a more technical outline, see Dave Malham's Primer on Basic Ambisonics. Also useful as an introduction to the current state of the art is Ambisonics for the New Millennium. More detailed discussions of the principles and practice of Ambisonics are given in the other articles. "Ambisonics goes further than stereo in that what it does (to first order) is to sample the acoustic field in such a way that the combination of the signals from all the loudspeakers in the array produces ... a reconstruction of the original acoustic wave field (both travelling and standing wave components). If a listener puts his head in the sound field, because the wavefronts are similar to the original, the perception of directionality and space should correspond to the original too. It is a "wavefront reconstruction" scheme in the small. The ear signals (crosstalk and all) will be correct if the reconstructed wavefronts are correct. This is just like natural hearing. Increasing the number of loudspeakers in Ambisonics (each fed its correctly-decoded signal) increases the accuracy of the reconstruction and the region over which it holds up. The interaural arrival-time differences also correspond to natural hearing in Ambisonics." Comments on this site will be gratefully received, especially notification of errors (I scanned in some of this material as the original files had long since vanished; some OCR errors may have slipped by). If you find any broken links, please report them. The interwoven circles logo was developed by Dr. Geoffrey Barton, the inventor of Trifield. It is based on the original Ambisonic logo which symbolizes the content of a B-format Ambisonic signal, consisting of W, the mono component (represented by the large outer circle); X (front minus back) represented by the vertical figure-eight composed of two circles; Y (left minus right), represented by the horizontal pair of circles; and Z (up minus down) which is represented by the smaller circle at the center, suggesting a figure-eight seen from above. It is a registered trademark of Wyastone Estate Ltd / Nimbus Records, and is used here by kind permission of the trademark holders. A great deal of formerly proprietary Ambisonic technology is now in the public domain. The majority of intellectual property not in the public domain is held by Dr Geoffrey Barton (including Trifield technology, so-called 'Vienna' decoders and items related to the Gerzon Estate). Contact Dr Barton for licensing details. It is customary for the Ambisonic logo and mention of the system to be added to record releases, etc, and this usage is encouraged. All trademarks and registered trademarks are the property of their respective owners and are duly recognised. This site and its contents are copyright Richard Elen © 1998-2015. Contents are available for teaching, private study and other applications.